The Wake Forest University School of Business logo is the most visible and recognizable element of our identity. There are two versions of the logo—stacked and horizontal—and either version is acceptable. The space limitations of a particular application will determine which one to use. The stacked version works best when it can be centered and floated in a generous margin of space, such as on the cover of a formal communication. The horizontal logo works well in applications, such as online banners and other materials with limited depth. In general, the stacked logo is more traditional in style, while the horizontal logo is more contemporary. 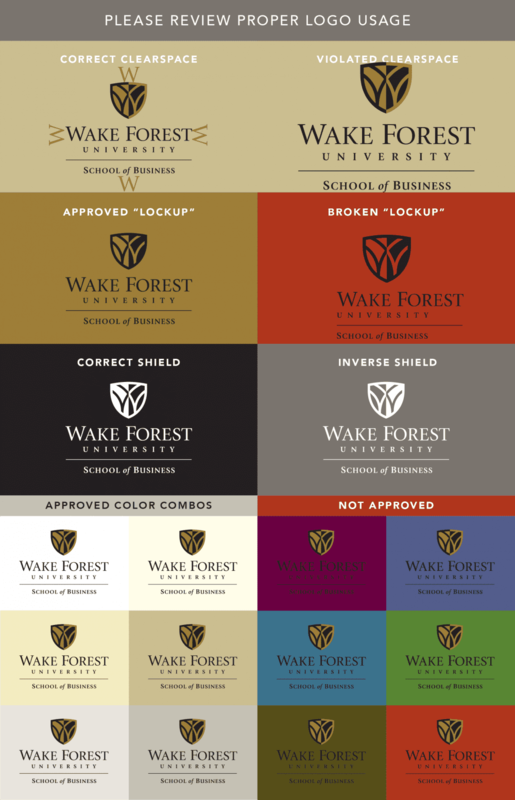 For more detailed information about the logo such as colors, sizes, and placement, visit identitystandards.wfu.edu. If you are using a School of Business logo for broad external use or on merchandise, please send your materials to Dave Hunt at huntde@wfu.edu to ensure that all brand standards are met.